I first made this pie… in February 2012. It was a birthday pie for my research student, Jenny. It must have been damn good pie because I never forgot it. Why was it so memorable? Several reasons. One, it was a ton of work. There is the salty pretzel crust. There is the gooey brownie layer. There is the candy bar layer. There is the cheesecake layer. And then there is the chocolate ganache layer. Assembled in that order. But, for the special someone, that special occasion, it’s totally worth the effort. Because the REAL reason why I remember this pie is because it made Jenny, and my other research students, so happy. That’s why I made this pie again… five years later. I was going to make it for another cadre of research students. I was going to enter it into the JMU Research Experience for Undergraduate (REU) bake-off competition. I was going to… but I didn’t. I ran out of time. Instead I built a mass spectrometer out of candy… because THAT took less time. Alas, my “candy quadrupole” resulted in the “Most Nerdy” prize and this pie would (obviously) not have been competitive in that category. So I reserved the redux for another special occasion (the 4th of July weekend) and for the MOST special of people (my husband and son). 2 cups finely chopped pretzels. Or leave pretzels a little “chunky” and mix with finely crushed graham cracker to yield a total of two cups. 2/3 cut semi-sweet chocolate chips. I used Ghirardeli minis. 6-8 ounces of candy bar. I have used Snicker and peanut butter Snicker. I think Reece’s cups would work, too. 1/3 cup heavy cream. Half and half works, too. Mix the flour, baking powder, cocoa and salt in a small bowl. Set aside. Add the chocolate and butter to a microwave-safe bowl. Heat in the microwave in 30 second intervals, stirring in between intervals, until the chocolate and butter are melted and well-combined. Set aside to cool slightly. Use a mixer to cream the eggs and sugar until pale and thick. Add the vanilla and melted chocolate/butter mixture. Add the dry ingredients and mix until just combined. Poor the brownie mixture into the pretzel crust. Here is where the Blue-eyed Baker and I disagree. She recommends cooking the brownie layer at 350 F for 15 minutes. I don’t think this is long enough. I recommend baking for at least 20 minutes. Cheesecake layer. Use a mixer to cream the cream cheese and sugar. Add the egg, egg white and vanilla. Mix until smooth. Arrange the candy bar pieces on top of the slightly cooled brownie layer. Poor the cheesecake batter over the candy and bake. The Blue-eyed Baker recommends baking for 16-18 minutes. I baked for 25 minutes. You want the cheesecake layer to be set. Chocolate ganache. Mix the chocolate chips and heavy cream in a microwave-safe bowl. Heat in the microwave in 30 second intervals, stirring in between intervals, until the chocolate is melted and the cream is well-combined. Evenly spread the ganache over the cheesecake layer. Allow the pie to cool at room temperature for at least 30 minutes. Chill in the refrigerator for a least three hours before serving. I recommend chilling overnight. Merry Christmas and Happy Holidays (a few days late)! In November my son turned one-year old. 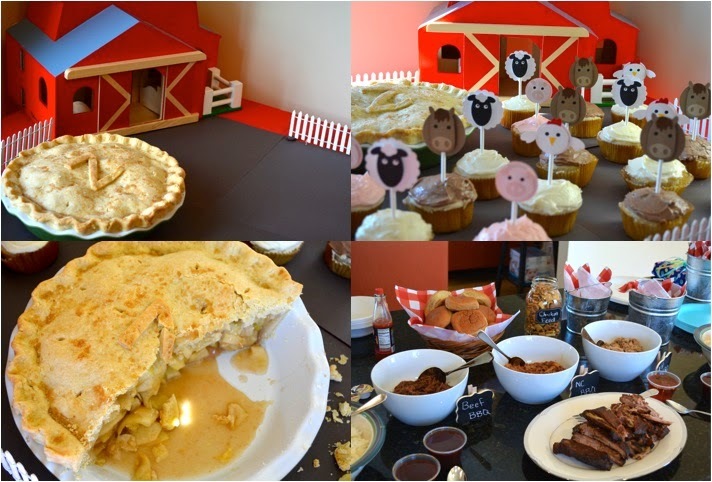 I had a lot of fun planning his farm-themed birthday party. Unfortunately, the traditional “smash” cake was a “no go” due to Z’s allergy to eggs. As a result, we had eggless cupcakes (a mini smash) and apple pie. Nothing says “farm” like apple pie! A few years ago, I made my own bitters (with mixed results). This short-lived craze led me to purchase “Bitters: A Spirited History of aClassic Cure-All with Cocktails, Recipes and Formulas” by Brad Parsons. While I no longer make bitters (or rarely mixed drinks, for that matter), I do still use recipes from this book, such as “Sweet & Spicy Bitter Bar Nuts” and “Bitter Apple Fried [Baked] Hand Pies.” The apple pie recipe calls for 1 teaspoon of Fee Brother’s whiskey-barrel aged bitters. If you live in a large metropolitan area, you will probably be able to find it (how I miss you, BevMo!). Or if you plan ahead, you can order it online. I live in western Virginia and rarely plan ahead so I substituted Angostura bitters, which can be found in most grocery or liquor stores. The bitter was perfected in 1824 and its ingredients are a proprietary mixture of herbs, roots, botanicals and barks. I will not even attempt to describe the taste of Angostura bitters (cloves? orange?) but will direct you to thecocktailgeek.com. All I can say is “try it!” Add a little Angostura bitters to your apple pie and you will experience a little somin’, somin’ that is totally indescribable—totally transformative. It will take classic apple pie to the next level… guaranteed! Toss sliced apples with lemon juice and zest. In a medium bowl, mix the flour, sugar, spices and salt. Toss the dry ingredients with the apples. Add the bitters and mix. Add the apple mixture to the bottom pie shell. Dot with butter. Roll out the top crust and place it over the filling. Trim the dough, if necessary, and seal the pie by making a folded/crimped crust. Cut vent slits in the top crust and dot with more butter. Sprinkle with turbinado sugar. 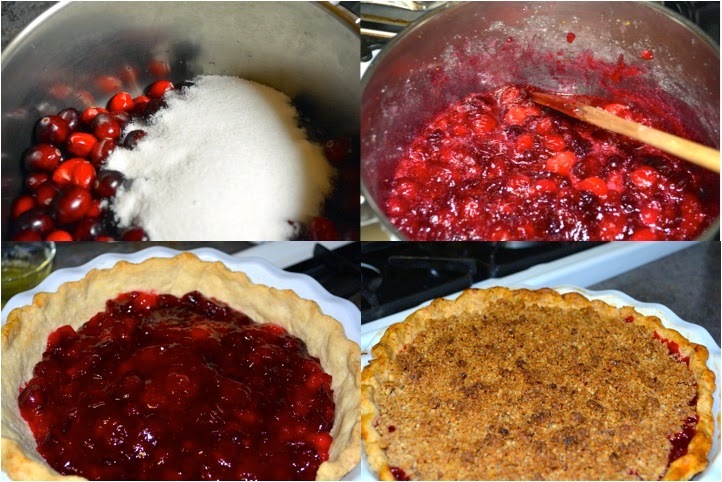 Bake the pie at 425 F for 25 minutes, then lower the temp to 375 and bake until bubbly, approximately 30-35 minutes longer. (When you lower the temp, also rotate the pie 180 degrees and add an aluminum foil collar if the crust is getting too brown). Allow the pie to cool to room temperature before serving. I recommend baking the pie a day ahead so it has plenty of time to cool and “gel.” There is nothing worse than an avalanche of hot pie filling from your beautiful, homemade crust!